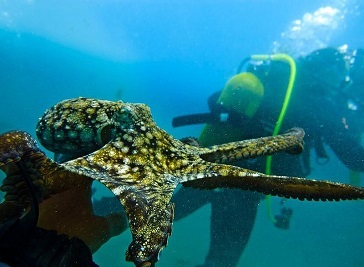 Gran Canaria is rich in marine life, with a huge variety of colours, shapes and species. The waters are warm and clear all the year round, and it’s position in the Atlantic just off the coast of Africa gives the island a mix of species from Mediteranean, Carribean, African and Atlantic waters. Much of the island is also surrounded by a rock shelf with depths of between 20 and 40 meters, making it an ideal depth for recreational diving. 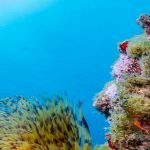 When you add to this the stunning scenery that historical volcanic eruptions have produced, and the effects of the gulf stream, you get an island with a fascinating mix of excellent dive sites. 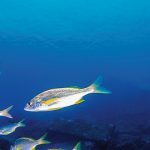 Gran Canaria has a fantastic selection of scuba diving and snorkelling sites which will delight divers of all levels and abilities. There are sheltered bays and coves where you can take an experience or training dive, or deeper wrecks where more experienced divers can explore. As you travel around the islands, there are a number of main dive sites which visitors explore on a regular basis. The best diving area on the island is unquestionably the Arinaga Marine Reserve on the east coast, known better as ‘El Cabrón‘, where divers from most of the major dive schools can be found every day of the week. Working towards the south there are several possible entries but these are onto unremarkable shores with variable visibility and little life. Gran Canaria is on the same latitude as The Red Sea, Florida and the Sahara desert, and has a similar sub-tropical climate. Daytime temperatures never drop below 14C in winter and are usually in the 30’s in the summer. Although very hot in summer, the humidity is relatively low and this makes the temperatures more bearable. The solar UV factor is very high however and a high factor sun cream is advised. For much of the year the island comes under the effect of the ‘trade winds’, which blow strongly from the North East, helping to keep the effective temperatures down. In addition, the Island has it’s own ‘micro-climate’ caused by the volcanic peaks and mountains in the centre. This is characterised by more cloud and lower temperatures in the North, around the capital, Las Palmas; and more sun and higher temperatures in the South and South West. Some days there is a 2C difference between Las Palmas and the Airport; 2C between the airport and Playa del Ingles and a 2-4C difference between Playa del Ingles and Puerto Rico. In other words, actual temperatures in the tourist resorts can be 4-8C higher than shown in the papers, on teletext or on the net for a Las Palmas temperature. See Gran Canaria Weather for more information. Since beginning operations in 1992 Scuba Cat Diving, Gran Canaria, Gran Canaria as become Spanish most complete, multi-national, multi-lingual Dive Centre. In 2007 we were awarded the top rating of PADI 5 Star Career Development Centre.